The Engine Pro Sprints On Dirt presented by ARP 2016 Awards Banquet took place at the Battle Creek (MI) Holiday Inn on Saturday, November 5. A night packed with light-hearted fun and heavy-weight awards capped off a great 2016 season with the crowning of Brian Smith as champion. 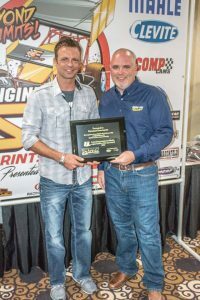 The drivers honored at the banquet will forever be remembered as those who made the new, unlimited Sprints On Dirt one of the most memorable changes in sprint car racing history. SOD president John Naida served as event host and emcee and opened the festivities by recognizing SOD promoter partners Butler Speedway, Crystal Motor Speedway, Hartford Speedway, I-96 Speedway, Merritt Speedway, Thunderbird Raceway, and Winston Speedway. Lexi Adgate, a competitor in a handful of 2016 SOD events herself, then began the presentation of trophies and awards. 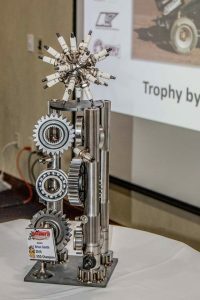 Each year, Engine Pro recognizes the Engine Builder of the Year award for its high level of craftsmanship and dedication to the Sprints On Dirt racing community. The 2016 recipient is Gressman Powersports from Fremont, Ohio. Gressman is the engine builder for SOD Champion Brian Smith. 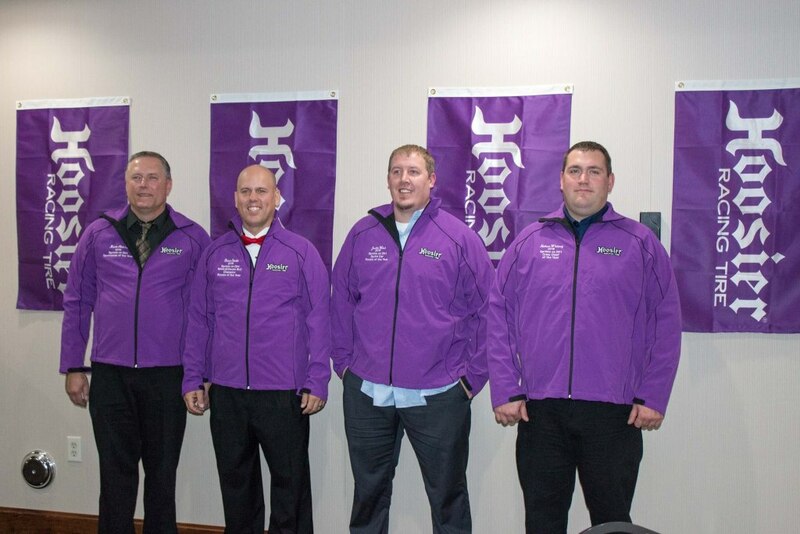 Rod End Supply and Keizer Aluminum Wheels recognized Brian Smith, Steve Irwin, Mark Aldrich, John Gall, Justin Ward, and Eric Smith for participation in every 2016 SOD event. 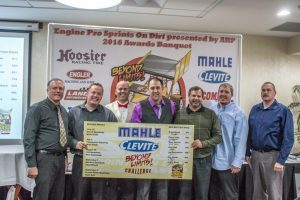 The Engine Pro Sprints on Dirt presented by ARP MAHLE/Clevite Beyond Limits Challenge, formerly the MAHLE/Clevite Short Track Challenge, had a very different look for 2016. The top twelve SOD competitor members in points were introduced and presented with trophies and awards by Lexi Adgate. 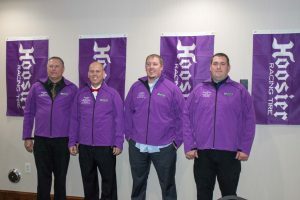 Hoosier Racing Tire awarded jackets to Champion Brian Smith, RockAuto.com Sprint Car Rookie of the Year Justin Ward, XYZ Machining Sportsman of the Year Mark Aldrich, and XYZ Machining Crew Chief of the Year Nathan Whitney. 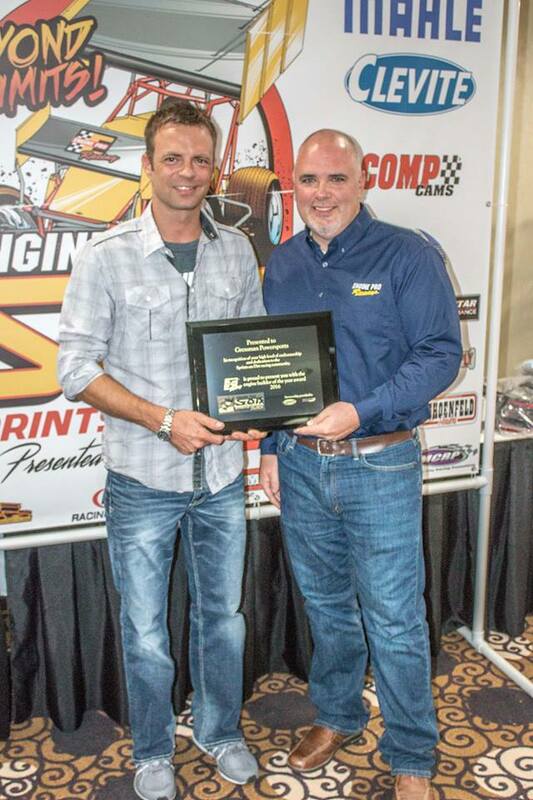 Maxim Racing provided Mark Aldrich, Brett Mann, Eric Smith, Robert Huisken, and Tyler Bearden with contingency awards. In addition, birthday boy Josh Turner was presented with a birthday cake during his introduction. Attendees were presented with a few facts about the 2016 season. 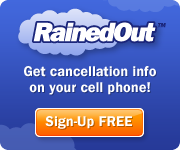 There were five rain outs and threatening weather on five other dates, but the first season under the new unlimited format was still a great success. Car counts were equal to 2015 in spite of several no-shows due to weather. The on-track product was exceptional with only one spin out for every 986 laps run. 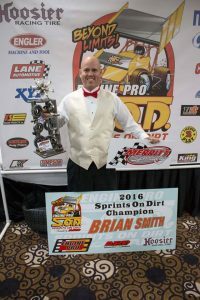 Seven drivers, Brian Smith (3), Ryan Ruhl (2), Chad Blonde, Stuart Brubaker, Steve Irwin, Max Stambaugh, and Doug Zimmerman, won features. In spite of only ten events completed, competitors were well rewarded. Brian Smith was awarded $6,440 in cash and awards. $1,295 in cash and awards was the least amount awarded to the member drivers present. Engine Pro Sprints On Dirt presented by ARP awarded competitors $41,110 above and beyond purse payouts in 2016. 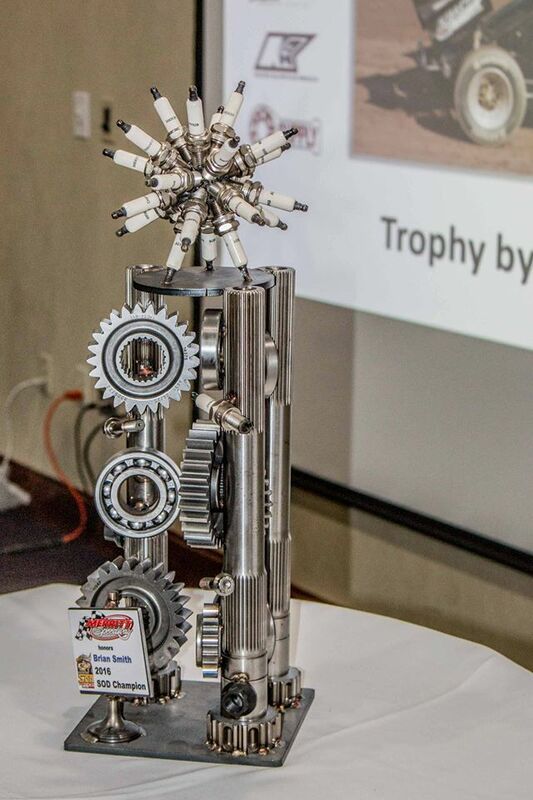 Engine Pro Sprints On Dirt presented by ARP would like to thank everyone whose extra effort made the banquet a perfect close to the 2016 season. Thank you to Motor City Racing Promotions Scott Menlen and Laura Tucker for set-up and tear-down. Thank you to Pat Holzinger and Kathie Naida for handling registration. Thank you to Wendy Rominger and the staff of the Battle Creek Holiday Inn for their superb facilty and services. Thank you to Thomas Michael for photographing the banquet. A very special thank you also goes out to Lexi Adgate for her hard work in distributing the cash and contingency awards. To see two great photo albums of the historic banquet, click here and here. 2016 race event sponsor partners were Engine Pro (Title Sponsor), ARP (Title Sponsor), Hoosier Racing Tire (Official SOD Tire), MAHLE/Clevite (Beyond Limits Challenge Sponsor), Engine Pro (Lucky Dog Sponsor), Lane Automotive (Primary Heat Race Sponsor), Engler Machine & Tool (Primary Heat Race Sponsor), COMP Cams (Primary Heat Race Sponsor), RockAuto.com (SOD Series Rookie of the Year Sponsor & SOD Sprint Car Rookie of the Year Sponsor), XYZ Machining (Sportsman of the Year Sponsor & Crew Chief of the Year Sponsor), KSE Racing Products (Hard Charger Sponsor). In addition, SOD event contingency sponsors included: Allstar Performance, ATL Racing Fuel Cells, BR Motorsports, Diversified Machine Inc. (DMI), Keizer Aluminum Wheels, King Racing Products, Kistler Racing Products, License 2 Play, Racing Optics, Rod End Supply, Schoenfeld Headers, and Ti22 Performance. This entry was posted on November 10, 2016 at 5:37 pm and is filed under Uncategorized. You can follow any responses to this entry through the RSS 2.0 feed.